She’ll be part of a benefit Nov. 5 called Duelin’ Divas II. 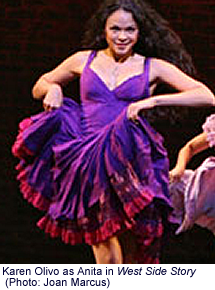 Olivo, who also starred in Broadway’s In the Heights, is not actually one of the so-called Divas: Those are a dozen or so singers who have performed at Theatre Winter Haven in recent years, who will perform in a talent competition on which the audience will vote. Olivo, who also played Anita at Theatre Winter Haven — in 1993 — will sing after the rest of the performers and then will crown the winner. She’ll also conduct a master class Nov. 4. Tickets to the Nov. 5 benefit, which is at 7:30 p.m., are $55 and includes drinks, hors d’oeuvres, a diamond giveaway and dessert with the Divas. Reservations are available online or at 863-294-7469. More details: 863-299-2672. This entry was posted in Broadway, Celebrities, Community theater, Fundraisers, New York theater, Orlando theater and tagged in the heights, Karen Olivo, theatre winter haven, West Side Story. Bookmark the permalink. Is there any info how to sign up for Karen’s master class anywhere?